No matter how well intentioned and generous a gift might be, it can be refused—as NPQ has shown. One case where accepting a gift on a donor’s terms is impossible or unadvisable comes up when a foundation doesn’t do the research and legwork to make sure the grantee wants or needs it. The Krause Family Foundation announced plans last week to build a fully funded, $50-million recreation center on 60 of the 168 acres that make up Big Creek Park in Roswell, Georgia. It sounds like a once-in-a-lifetime gift; the proposed Angela Krause Tennis, Pickleball and Fitness Center, to be named for the late daughter of Roswell resident Vernon Krause, who owns four metro Atlanta automobile dealerships, would have been the most extensive set of clay tennis court facilities in the US. However, they did not ask the stakeholders, especially the community that uses the park, if the tennis courts were what the community wanted. The Roswell City Council stated they would vote on the memorandum of understanding (MOU) on the Monday immediately following Thursday’s announcement. Community opposition came swiftly, with 23,000 signatures on a Change.org petition in about 72 hours. The list of complaints and objections began with standard ones—increases in traffic and noise—and went to those more specific. Individuals and groups who used the park trails for biking, Scout hikes, and walking complained that the woods would be paved and that half the six miles of trails would be gone. Brad Wender, president of the Roswell Alpharetta Mountain Bike Organization, said his group and others have seen an outpouring against the proposed tennis complex. “We’ve had a lot of support from the whole community,” Wender said. “It was easy to see this was trying to be pushed through. It just wasn’t all above board. Wender estimates that about 10,000 bike riders per month use the trails. The Krause family said in a public statement that they were told the land was purchased to be an active park, not as a passive park. 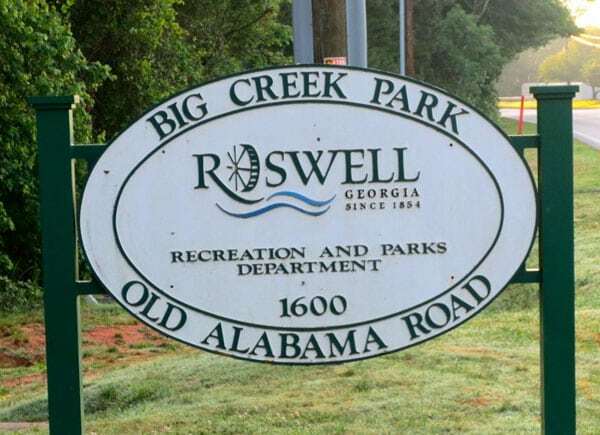 Julie Brechbill, a Roswell spokesperson, confirmed that the park was not meant to stay wooded, and that there were plans for a variety of things, such as an arts center and an aquatic center. However, the land’s purchase was for use as a park. The residents like their wooded trails as-is, thank you very much, and change is not what they have in mind. With the announcement and the scheduled City Council meeting only days apart, the residents felt the matter was being pushed through in a rush without letting them weigh in at public meetings. Henry thanked the Krause family and left the door open for future development. “In the coming months, we will hold a town hall meeting for further input from residents on the possibility and location of a tennis center in Roswell,” she said.